Marvolis rings are premium silicone rings that are designed to look great and fit your life. Do what you love: Climb, bike, hike and your symbol of love would still fit right in without getting in the way. Our rings are stylish, comfortable, durable, and is perfect for occasionally used or an always-on, primary wedding ring. Authentic Marvolis rings "Sold by Marvolis and fulfilled by Amazon" are protected by 100 year warranty*. Get one for you and one for your other half today! SLEEK & COMFORTABLE- Our rings are designed for style and crafted with a top quality medical-grade silicone for maximum comfort. They are versatile, comfortable, and durable, without interfering with your activities, whether you swim, mountain climb, or lift weight. 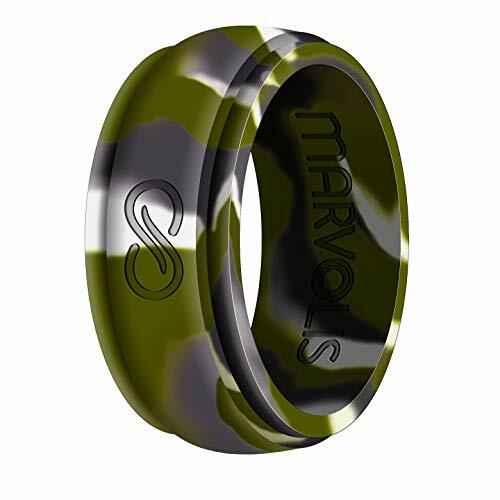 GREAT FOR ACTIVE MEN- Sturdy, top medical-grade silicone makes up the material of the Marvolis rings. Great for active men who risk damaging wedding rings during work or in sports or outdoor activities. For safety, our rings break under pressure, but are not easily stretched or damaged during activities. Makes the perfect gift for any active man who want to show their pledge of love anywhere. COMMITMENT, NOT ADVERTISEMENT- Proudly show your love and commitment in style, not our brand. All branding and markings are discreet. SAFE DESIGN, LAST A LIFETIME- Marvolis rings are designed to keep you safe. Our rings will tear under stress to prevent you from injury and are fully protected by replacement warranty. 100 YEAR WARRANTY- Authentic Marvolis rings are only sold by Marvolis. You have 90 days to return for full refunds if you're not happy for any reason. Our rings are also backed by 100 year replacement warranty. Offer only valid for rings sold by Marvolis. If you have any questions about this product by Marvolis, contact us by completing and submitting the form below. If you are looking for a specif part number, please include it with your message.